NOTE: We recommend the massage for mothers out of their first trimester. Massage for therapeutic purposes has been around for centuries, and it has been used to relieve stress, ease muscle tension, and improve the overall health of the individual receiving its benefits. In the modern era, however, many people, especially those who are pregnant, have wondered about the safety of massage during pregnancy. This has caused a lot of ladies to be hesitant about receiving a massage when it can actually be quite beneficial during prenatal care. So what are the benefits of prenatal massage? When a woman is pregnant, it is easy for her to carry stress and tension, especially as her body begins to grow from the inside. Prenatal massage can greatly help to relieve this tension and stress, making pregnancy less physically taxing and help her focus on the exciting times ahead with her newborn. Prenatal massage is also excellent for reducing anxiety and lowering symptoms of depression. Receiving prenatal massage is also great for the body, in the sense, that it relieves joint pain and muscle aches; which are two common symptoms that plague women during pregnancy, especially during the second and third trimesters. It can also improve the outcome of labor, which is something that all soon-to-be mothers are concerned about. It can also be highly beneficial for the health of the newborn. One excellent factor of massage is that it makes use of a variety of techniques in order to narrow in on the specific needs of the individual receiving the massage. One such technique is Swedish Massage. This form of massage works well when it comes to relaxing the muscles of the body and improving circulation of the blood as well as the lymphatic system. This is all done using mild pressure that is applied to various muscle groups located in the body. Swedish Massage is highly recommended for pregnant women due to the fact that it tackles many common causes of discomfort that are associated with changes in the circulatory system and skeletal system caused by hormones. Speaking of hormones, when a woman becomes pregnant her hormones begin to fluctuate in quite a large way. 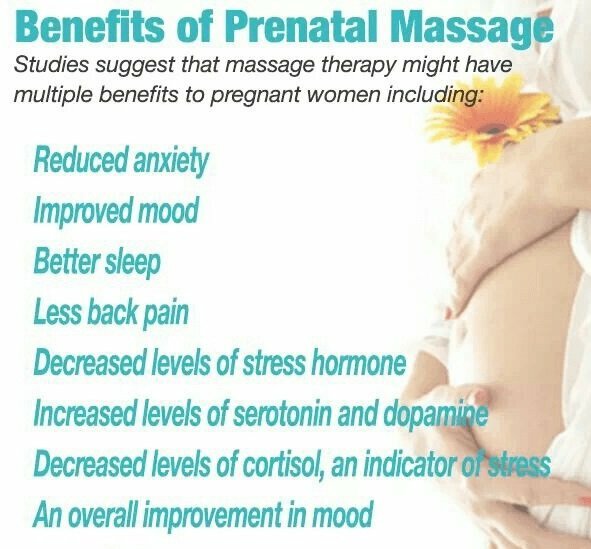 When prenatal massage is introduced as a means of prenatal care, hormone levels are impacted in such a way that not only is stress altered and relaxation promoted, mood regulation is restored as well as excellent cardiovascular health. Studies conducted on hormones during pregnancy showed that when pregnant women received a prenatal massage every two weeks for five weeks the hormones associated with stress (nor-epinephrine and cortisol) were lowered and the hormones that, when balanced, ease symptoms of depression were increased (dopamine and serotonin). Changes in hormones such as these have been proven to lower the chance of complications during childbirth and reduce the chances of complications with newborns, such as a low weight at birth. Therefore, it is recommended that prenatal massage be incorporated into prenatal care so that mom and baby can both enjoy the benefits that it provides. What are some other reasons to treat yourself to prenatal massage? During pregnancy, the swelling of the joints is fairly common. This is otherwise referred to as edema and it is generally caused by the increased circulation of the blood as well as pressure caused by a rapidly growing uterus. Massage can help to ease this swelling and aid the drainage of fluid within the lymphatic system. Nerve pain is also positively affected when a pregnant woman adds prenatal massage to her care. The swelling of the body can put pressure on nerves, especially as the uterus grows. Thankfully, prenatal massage can work to ease this pressure and reduce nerve pain felt throughout gestation. Of course, those who are hesitant about prenatal massage because of safety concerns are not wrong to be concerned. Like anything involving the body, prenatal massage should be handled with care and given by a licensed and knowledgeable professional. Get a prenatal massage in Dallas at Riviera Spa by our reputable and licensed staff. We offer prenatal massage in Dallas for pregnant women that are in their second and third trimesters. We want the entire sessions to be very relaxing for you and your baby. It is a great bonding time between you and your newborn. For centuries, massage has been used to soothe both body and mind for overall health, reduced stress, and quality of life. Prenatal massage is certainly no exception. For the care of mother and child, comfort and health during gestation, and reduced chance of complications during birth we recommend that you seek out prenatal massage as part of your care in the third trimester. You will be amazed at how well it helps you to feel. Contact us today to reserve a spot and book a prenatal massage in Dallas!